Terra Therma have designed and installed a low energy Daikin Altherma Air Source Heat Pump to provide eco-friendly low cost energy to the our Underfloor Heating and domestic hot water system. 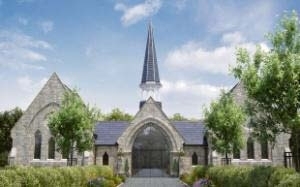 Renovation work costing more than £1million is under way on a derelict chapel in Westcliff to create a new base for community groups and charities. Terra Therma were contracted to design and install a bespoke Air Source Heat Pump system to feed our underfloor heating system providing a comfortable and sustainable many years to come. The old Prittlewell Chapel in North Road, Westcliff, is being transformed into the new centre, run by the Southend Association of Voluntary Services. The project is being funded by a community assets grant of more than £998,000 from the Government. A further £21,712 is being provided by the Southend Economic Participation Programme through the East of England Development Agency. Once completed, the refurbished chapel will be transferred to community use when it is leased to the association. The dilapidated building’s dramatic revival into a sustainable, energy-efficient centre, will be the subject of four short films being made by Blade Education. North Road Cemetery was originally created to provide extra burial capacity for St Mary’s Church in Victoria Avenue. The chapel was built in 1879 within the grounds of Westcliff cemetery, and the council bought the freehold for £900 in November that year. Although the cemetery itself is currently near capacity and rarely used, internment is still carried out in family graves. There are a high number of military graves within the cemetery, so there are also plans to provide information boards to give more details about the background of these.